Lightweight Directory Access Protocol (LDAP) refer to a protocol application layer that enables access to a directory service to search a variety of information. Lightweight Directory Access Protocol (LDAP) is originally a protocol for querying and modifying of services directory. This protocol is based on TCP / IP. A directory is a set of objects with attributes organized in a logical hierarchy. The most common example is the telephone directory, which consists of a series of names of peoples or organizations those are arranged alphabetically, with each name having an address and phone number attached. To understand better, it is like a book or folder in where you write people’s names, addresses and telephone numbers and sorted alphabetically. The Lightweight Directory Access Protocol (LDAP) directory tree often reflects various political boundaries, geographical or organizational, depending on the chosen model. Lightweight Directory Access Protocol (LDAP) deployments today tend to use names Domain Name System ( DNS) to structure the higher levels of the hierarchy. As you descend into the directory, entries representing people, organizational units, documents, groups of people or anything else that represents a given entry in the tree. Typically, information authentication (username and password ) is used to authenticate and it can store other information (user contact data, location of various network resources, permits, certificates , etc). To summarize, LDAP is a protocol for unified access to a set of information about a network. The current version is LDAPv3 and is defined in RFCs RFC 2251 and RFC 2256 (document base LDAP), RFC 2829 (LDAP authentication method), RFC 2830 (TLS extension) and RFC 3377 (technical specification). Lightweight Directory Access Protocol (LDAP) was developed at the University of Michigan developed (UMich) in 1993. At the same time, UMich introduced the first server implementation, which is known as UMich LDAP today. The LDAP is a simplified alternative to the Directory Access Protocol (DAP), which as part of the X.500 standard. The X.500 standard is very comprehensive and is based on a complete ISO / OSI stack, which made ? ?implementation difficult and hardware-intensive. LDAP was developed with the goal of making directory services easier and therefore more popular. LDAP uses a TCP / IP stack and implements only a subset of DAP functions and data types. As a result, LDAP could be implemented on personal computers in the early nineties and gained a wide application base. 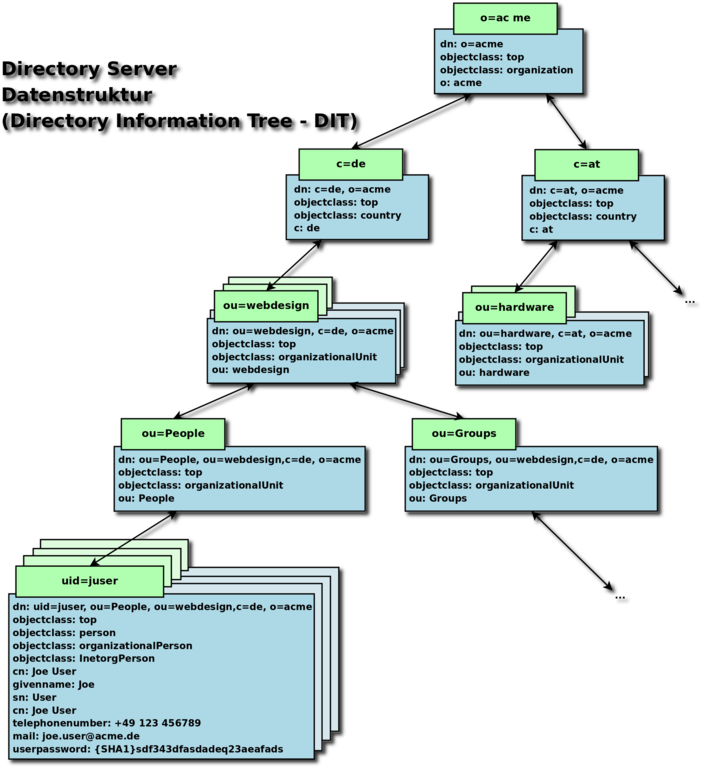 The data structure of an LDAP directory is given by a hierarchical tree with roots, branches and sub divisions. The tree is also called the Directory Information Tree (DIT). The root (root, suffix) is the central data object under it is the branch for the higher structures. Thus, the organization of the data randomly use any LDAP directory a specific, standardized and possibly extended structure. The structure is used by the defined schema. A LDAP schema defines each object classes and their attributes, organization such as the person class or the class. The LDAP directory entries are called objects. Each object belongs to at least one, but usually several classes. There are three types of object classes : As an object must belong to at least one structural class, which is the default. There are also helper classes that can be used to assign various attributes like objects. Last but not the least, there are abstract base classes from which no objects, but only minor base classes can be generated. Each object is composed of independent and attributes. A single object is uniquely identified by the Distinguished Name (DN). This consists of each Relative Distinguished Names (RDN). Another notation for the DN is the canonical name that does not contain the attribute tags and in which the separation between is by slashes. Moreover, the sequence begins, in contrast to dn, with the first entry. Each attribute has a type of an object and one or more values. Type the names of the attributes are most easily remembered as abbreviations. LDAP is used today in many areas, for example: Address such as Apple Address Book, IBM Lotus Notes, Microsoft Outlook, Mozilla Thunderbird , the OpenOffice.org and LibreOffice mail merge and to create the mail client User management, such as Novell eDirectory , Apple Open Directory, POSIX accounts, Microsoft Active Directory Service Authentication such as PAM Management of user data for SMTP, POP, and IMAP servers and in the following mail servers: postfix, qmail, exim, Lotus Domino, sendmail, Cyrus, Courier. This Article Has Been Shared 7430 Times! Cite this article as: Abhishek Ghosh, "Lightweight Directory Access Protocol (LDAP)," in The Customize Windows, July 7, 2013, April 21, 2019, https://thecustomizewindows.com/2013/07/lightweight-directory-access-protocol-ldap/.